This page is not intended as a comprehensive guide to planning your whole installation, the individual subject pages will (more or less) provide that. It is a reminder of the order you should approach things and where to find the information on the relevant points, if you haven`t got time to read the whole site ! laugh whilst you learn at Cowboys` Locker. Also see Patrick Holdaway`s article on using Google Earth to line up an aerial. Unsure if you`ve included everything you need in your order ? 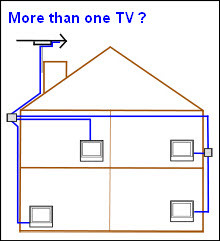 See TV Aerial Kits or try using this sequence,which follows the route of the signal from start to finish ! Aerial > Cable > Diplexer and/or Splitter and/or Amplifier (if required) > Pole > Bracket > Wall Screws/Plugs/V Bolts or Chimney Lash Kit > Cable Clips > Hole Tidy > Plug(s). The most important decision is choice of aerial because it is only at the antenna that the vital signal quality can be attained, but this is dependent on which transmitter you`re on and your signal strength. 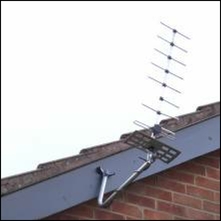 Thinking of installing the aerial in the loft ? If so read this page. Now we have to decide which transmitter to use, see the article on this subject. Once you have identified the transmitter(s) check if we have a page dedicated to it, if not look on digital transmitters nationwide. Both these pages will give information on the aerials we recommend for the relevant transmitter(s). 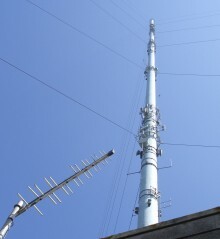 If your transmitter is not listed on either source check the generalised article on Which Aerial For Which Transmitter. If your signal strength is strong or medium you don`t really need to know what transmitter you`re receiving your signals from, just use a Log 36 ! For radio aerials see FM/DAB. If you`re unsure which aerial to choose, go for a Log36. If this does not give an adequate signal try adding a Mast Head amplifier. Many people find the relevant aerial reports are helpful in deciding which antenna to go for. Signal strength is important not only for aerial choice but also if you are planning to run more than one TV from your antenna. If your signal strength is strong or medium you don`t actually need to know what transmitter you`re receiving your signals from, just use a Log 36 ! Unless you already have decent satellite quality cable installed (which you know is definitely in good condition) the downlead should be changed as a matter of course. The choice of cable is easy because we only stock one type, and that is the best, i.e. 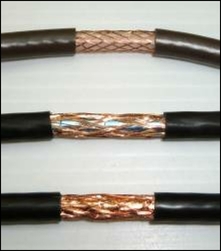 copper/copper double screened satellite cable ! The only choice is what colour do you want, Black, Brown or White ? ! Also see the importance of cable and the routing of it. Poles are available in 3ft, 5ft, 6ft, 8ft,10ft & 12ft lengths. For help on deciding on pole height see use of longer poles, or to research cranked poles or "standoffs" (usually to clear the eaves above the install) consult the relevant highlighted links. Once pole height has been decided next comes the bracket, try consulting which bracket for which pole. Also see wall or chimney mount ? Try the Digital UK coverage checker (ensure detailed view is ticked) and it will give you an educated guess of which transmitters you could possibly use and the approximate signal strength. This is certainly easer than working through the relevant articles on this website, but it`s not as accurate ! Are you going to feed more than one TV (and/or radio) ? If so, knowledge of your signal strength is also very important so you can decide if you should use a splitter or if you need an amplifier. If you are in a poor reception area an aerial amplifier may help, but is a mains amp or a "mast head" more appropriate ? "aerial more important than amplifier" !